If you've ever wondered how to add the perfect touch of rustic farmhouse decor to your home, then these charming Rustic Bronze Bulldog Clips are exactly what you've been searching for. Not only will they give a vintage look to your photos, walls, home decor but they will bring a smile to your face every time you walk into the room, but they're sure to get tons of compliments when guests come over as well! BarnwoodUSA is committed to providing exceptional customer service and will always back our 100% money back guarantee if you are not overall satisfied. 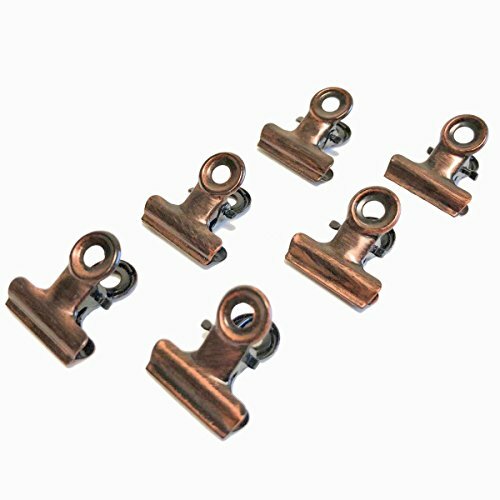 These beautiful Rustic Bronze Metal Hinge Clips come in a pack of 6, with an opening of half an inch. Hang them together or around the home to give any item that rustic vintage feel. With just a little bit of creativity, you can use these wonderful bronze clips to draw the viewer's eye to anything you'd like! We offer this pack in an antique bronze finish... The Pack of Bronze Clips measure 1 inch long -- The width will be 0.875 inches wide. They'll ship to your home quickly and easily, and everything you need to mount these Rustic Bronze Metal Hinge Clips arrive with the product. We're confident that after seeing the way they look on your walls, photos, and anywhere in your home you will continue to choose BarnwoodUSA for all your rustic decor needs. These Antique Bronze Metal Hinge Clips are sure to add a dash of rustic charm to any room in your home! HIGH QUALITY MATERIAL; Made of Metal with a Rustic Bronze finish. CONTAIN CAPACITY; The clip can be opened as wide as 0.5 inch. SUPER APPLICABLE; These clips are perfect for hanging photos, displaying notes, file cabinets, locker or office uses. PACK SIZE AND DIMENSIONS; Set of 6 Rustic Bronze Bulldog clips with 6 screws included, each wall clip measures 1" x 0.875". 100% MONEY BACK GUARANTEE; If you aren't satisfied, we'll refund every penny. View More In Scrapbooking Embellishments. If you have any questions about this product by BarnwoodUSA, contact us by completing and submitting the form below. If you are looking for a specif part number, please include it with your message.